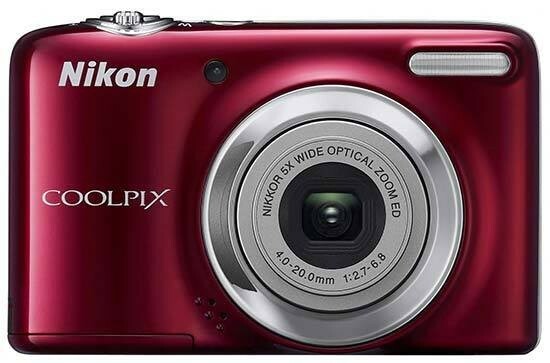 The Nikon Coolpix L25 is an easy to use digital compact camera aimed at the novice user, featuring a 10 megapixel CCD sensor, 5x optical zoom, 720p HD video recording and AA battery compatibility. Designed to be fully automated, the L25 will think the picture through for you meaning all you have to do is aim and press the button. The best part of the Nikon Coolpix L25 is the price. At around £50, the L25 is within reach of even the tightest of purses and is available in red, black, gold and silver. The design of the Nikon Coolpix L25 follows a few years of tradition. The simple arrangement of a slim body with a small grip to the left (which has a double purpose of increasing one-handed shooting capability and housing the bulkier AA batteries). The small lens on the front is surrounded by thick silver rings – possibly to make it look bigger than it actually is. On the top, the small power button is sunken into the body to prevent getting confused with the shutter release button and switching the camera off by accident when you're taking that crucial shot. By contrast, the large shutter release is much larger than traditional buttons on other cameras and its likely purpose is to simply shout at you that it's what you should be pressing. After all, no-one can resist pressing a big button. The zoom rocker is wrapped around the shutter release for easy operation of a probing index finger while holding the camera up at arm's length. The lens is a standard 5x optical Nikkor zoom type. In 35mm terms, its range is 28-140mm. Move onto the back and the design is a tried and tested layout. Towards the top of the Nikon Coolpix L25 is a small red button that gives direct video recording regardless of the mode you're in at the time. Slightly above this is a flash charging light which will flicker while the flash is recycling. To the left is a small thumb rest. The L25 has a 3inch screen on the back which is actually bigger than some more expensive cameras. It's not the brightest screen and the colours are a bit flat so it's worth waiting until you get home to look at them before deleting them. The button with the green camera is the shooting mode button and has four options. You can choose between Easy Auto, Scenes, Smart portrait and Auto. easy Auto is signified by a green camera with a heart icon. It analyses the scene as you shoot and adjusts the camera mode to suit what is in the frame. For example, if you're on holiday taking a picture of a really interesting lizard and it's filling the frame, the camera will see the closeness of the subject and automatically put the camera into macro mode. Scenes allows you to control the scene mode you'd like the camera to use. The camera won't deviate from this instruction unlike in Easy auto where it could adjust as many times as it likes. Towards the bottom there's a Smart Portrait mode which will adapt to the situation while ensuring a good portrait and finally, the Auto mode will still do everything for you but allow you to make simple adjustments such as white-balance, continuous shooting and colour options. This latter setting will add a digital cast to the pictures and there's four to choose from: Vivid colour, Black & white, Sepia and Cyanotype. These are accessed through the menu button that is found at the bottom of the camera next to the delete button. Although that can only be used in playback. The navigation dial has secondary commands on it to ease your photographic experience. There's options to adjust the flash settings, change the self-timer, exposure compensation or switch on macro. Simply pressing the appropriate button then selecting the desired setting is all it takes. At this price point you're not going to get a metal body. There's possibly a metal skeleton to add some rigidity but the outer casing is plastic. The build doesn't feel any worse than a model double this price though. There's no lock on the battery door and the batteries are AA type. While this is more appropriate for a camera of this kind, they exert pressure on the battery door which could pop open if caught. The memory card sits next to the batteries in the same compartment. One useful factor is that Nikon have added SDXC compatibility to the L25. These types of cards have huge capacities with a theoretical top limit of 2Tb (terabytes, or 2048Gb). There wouldn't be a reason at all why you'd want a card that big for a camera like this but the fact that they put it there is welcoming. The screen isn't the best quality. It does its job but there's a certain quality lacking that gives it the appearance on the screen of a 1980's video camera. However, this doesn't record on the pictures. The menus have been simplified to make using them a lot easier for the type of consumer that the Nikon Coolpix L25 is aimed at. There's no metering or focusing options. There's not even an ISO setting which will make our noise test interesting. On the most open menu setting – the one when in Auto – there's three tabs: One for shooting, one for video and one for the set-up area. The first tab holds settings for the aforementioned white-balance, resolution, continuous shooting modes and colour options. The video tab has only one option for resolution. There are three choices of QVGA (320x240 pixels), VGA (640x480 pixels) and HD 720p (1280x720 pixels). A lot of people think that HD has to be 1080 but it doesn't. 1080 is generally regarded as FullHD, 720 is still classed as HD quality. The final option is the set-up menu. It's much more in-depth than the other menus and changes settings such as the language, date & time, video mode and automatic sleep mode. There's also a setting to change the blink warning when taking portraits and Eye-fi upload enable. For this last option you need an Eye-fi compatible memory card (a memory card with built in wifi). Start up time from the off position to switching on, focusing and taking a picture, the Nikon Coolpix L25 produces a respectable 2.5sec performance. That's a standard time for a digital compact camera in the beginner point and shoot category so it falls in with other models nicely. Continuous shooting starts off fast but slows as the buffer begins to fill. We got three pictures in the first 1.5sec but then only managed nine in total over a ten second period. The camera does download fast though, we got those pictures onto the card and were ready to shoot again by the 12th second. Pressing the blue arrow button switches over to the Playback mode. When the picture first comes on the screen, there's some basic shooting information. Don't expect too much, there's only the date, image number, file order and resolution used. In the menu, there's some basic editing available such as D-Lighting (a programme that increases the dynamic range of the image by retaining detail in the shadows and capping burn out in highlights), skin softener and rotate. There's also slide-show options, protect images and copy. In the box, you'll find a camera – which is useful, two AA batteries to get you started, a wrist strap, USB cable, a paper-based Quick start guide which looks embarrassingly big to be a quick guide but is actually multi-lingual. There's also two CDs, one with the full instruction manual on it and the other has Nikon's ViewNX2 editing suite.